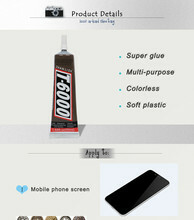 T-6000 is a meet the Toys ,Point drill, all kinds of decoration, flowers, cloth, shell, jewelry, crafts and other industries special bonding adhesive, compared with other adhesives,irritant odor is small; is a single component of a new transparent solution of plastic, room temperature curing, easy to operate without re-packaging.Open the lid can be used with high flexibility, film soft, anti-vibration and waterproof. 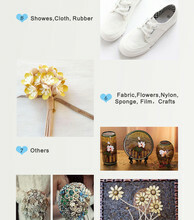 Features: not white, not yellow, not stiff,Ultra-low odor,Not easy wire drawing. 1, before use carefully read the product description introduction. 2, in front of a large area, please do test a small area. 3,Make sure that the sticky surface clean and dry. 4, the optimum temperature should be between 18-32 degrees. 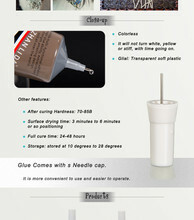 5, the product can be directly lid on demand is evenly coated surface of the adherend. 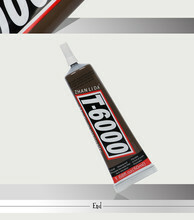 6, wait 3-6minutes, and the two are aligned adhesive sticky little pressure. 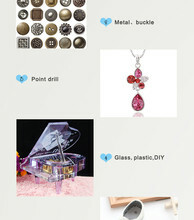 7, Put a few hours can be, 48 hours to reach the best condition. 8,When the product is not in use, please cover the lid, avoid glue and air contact after curing. 1, may be irritating to the skin and eyes. 2. Use in a well-ventilated environment. 3. In case of contact with eyes, rinse with plenty of water. 4. Keep away from children store, production operations, please stay away from fire. 5.Shelf life of 1 years, safe use of the product after the bottle. 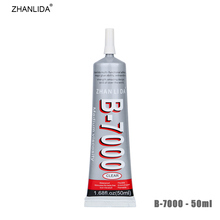 Paste adhesive can be more material on metal, glass, ceramics, stone, bamboo, cloth, leather, Shade, mobile door,ABS, nylon, sponge, film, fabric, electronic components, polypropylene, hard PVC, EVA and other plastic special glue,Rubber, fiber, paper, paste mobile phone border, LCD screen and other materials have a good paste performance. Note:This section glue No need to purchase a needle to use.